Get free advice and estimates from swimming pool builders in your city. Pools are beautiful, fun, and give your home a luxurious appearance. You can install them inside or outside, depending on your space and needs. When deciding where to put your pool, however, there are many options to consider. We will outline the differences between an indoor and outdoor pool below so that you can make a more informed decision about which one is right for you. Both indoor and outdoor pools have options when it comes to shape, size, and style. Because outdoor pools are more visible, they tend to be slightly more decorative, featuring waterfall options or decorative decks. An outdoor pool is more likely to have choices that complement your landscaping and architecture. Indoor pools are usually less decorative, meant more for function than appearance. They may be more streamlined and are less likely to have unusual shapes. And while you can add decorative features to an indoor pool, you may find that the options are fewer. Due to their location, indoor pools can be more expensive to build, particularly if you do not already have an enclosure ready. Even in areas where a space already exists, breaking through the existing foundation to dig the pool dramatically increases labor and installation costs. Leveling and draining an indoor area may also add time and expense to the project, depending on the location. In addition, an indoor pool requires vapor barriers 1 for surrounding areas to prevent leaks and damage as well as ventilation if you choose to use a chlorine 2 system. 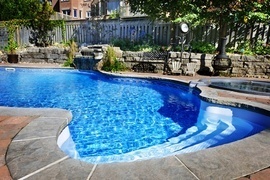 Outdoor pools are available as above-ground and in-ground models. Above-ground pools are easily assembled on site from a kit and generally take up less space. In-ground pools are, however, more technical to install, requiring digging, shoring, and pouring of concrete followed by installing the liner 3. Decks, fencing, gates, leveling, and drainage are also considerations to make with an outdoor pool. In general, indoor pools are more expensive to build than outdoor pools. 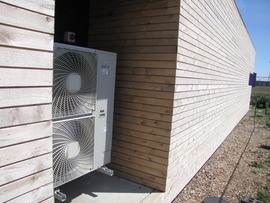 In addition to the line, pump 4, cover, and filtration system, you also need to take into account the labor of drilling through an existing foundation, dehumidifiers, vapor barriers 1, heaters, and ventilation. When adding the pool as an addition, you also have framing and finishing costs. For an indoor swimming pool measuring 12 x 24 feet, the average cost of installation is around $30,000. For an outdoor pool, the biggest costs are in clearing and preparing of the site. Digging, leveling, pouring the concrete, fencing, and finishing the area as well as the decking is also necessary. Outdoor pools also require the same filters, heaters, and pumps as indoor pools. A basic outdoor pool with the same dimensions, 12 x 24 feet, has an average cost of $16,700. This assumes that both pools are equipped with similar features, such as pumps, heaters, and filters. Outdoor pools are exposed to the elements, so without a cover, debris, leaves, and even small animals can get into the pool. Therefore, an outdoor pool needs to be cleaned more regularly to remove these items. However, because the pool is outside, no ventilation is necessary. Indoor pools are not subject to the same level of maintenance because they are not exposed to the elements. They require ventilation, however, to keep dangerous levels of chlorine gas from building up inside the area. Sun exposure contributes to the growth of algae in pool water, which is a big problem during the off-season months and when you do not chlorinate properly. Indoor pools are not exposed to sunlight, so there is no need to worry about algae growth. Pools that use chlorine to disinfect release chlorine gas into the air. This gas has a particular odor that has been linked to health issues such as migraines and asthma. Outdoor pools easily dissipate the chlorine into the air, eliminating strong odors. However, indoor pools require adequate ventilation systems to allow the free flow of fresh air, which raises costs and maintenance for the pool. Unless you live in an area that has good weather year round, your outdoor pool will likely only be used only during certain times of the year. And even in areas with favorable weather, a sudden rain shower or cold snap could drive you indoors and out of the pool. Indoor pools are not weather dependent. Use them at any time of the year, day or night. For that reason, people who rely on their pool for exercise may find that the indoor pool is more beneficial. During thunderstorms, lightning strikes can be dangerous. In fact, the National Lightning Safety Institute recommends a conservative approach to safety. A lightning strike, with extremely high voltage and current capacity, seeks to discharge electricity, and water is, unfortunately, a good conductor. One way to mitigate this is through grounding. Both outdoor and indoor pools need to be properly grounded. Grounding ensures that during a lightning strike, the energy is transferred to the earth, which helps prevent electric shock. Unfortunately, even when grounded, outdoor pools still present a risk of electric shock for users during a thunderstorm. Indoor pools do not have the same risk and are safer to use. 3 Liner: A covering, usually made of vinyl, for the walls and floor of a swimming pool, used to keep the water in and protect the pool's surface. How much does it cost to build an outdoor or indoor pool in my city? Cost to build an outdoor or indoor pool varies greatly by region (and even by zip code). To get free estimates from local contractors, please indicate yours. A chemical added to the water in a swimming pool to kill bacteria and microorganisms that can make people sick. Cost Considerations: When it comes to types of chlorine, the different types are best suited to different types of pools, such as small or large, indoor or outdoor, etc. The 3 inch tablets are the cheapest by weight ($2 to $4 per lb), but may be too large for smaller pools, and also take longer to dissolve than smaller tablets. A covering, usually made of vinyl, for the walls and floor of a swimming pool, used to keep the water in and protect the pool\'s surface. Cost Considerations: Vinyl liner pools can cost over $10,000 less to install than fiberglass or concrete pools. The liner must be replaced every 5-9 years, at a cost on average of $4,000, meaning they may not be cheaper in the long run.